I love warm weather food! There is nothing like it, and when the temperature breaks the 95F mark I pull out my favorite Summer recipes. 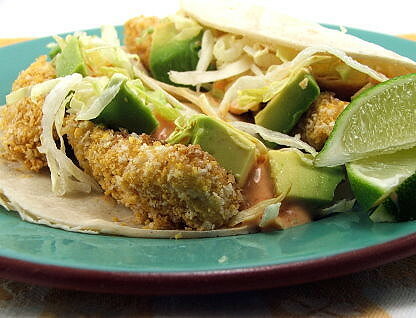 One such recipe is fish tacos. 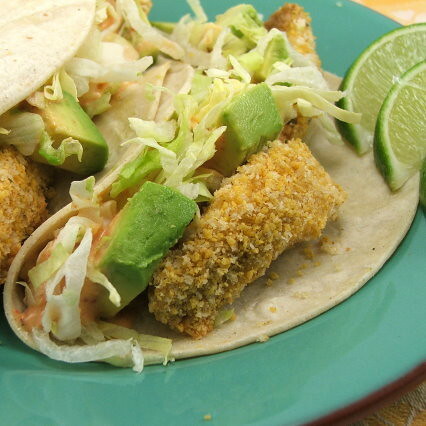 Cool and crisp lettuce, creamy avocado, and crunchy fish wrapped in a corn tortilla is perfect for a light afternoon lunch, or a dinner on the patio with a cold beer. There is just one problem with this dish, and that is deep frying the fish. Of course, you know I do not shy away from deep fried foods. It isn’t that the fish is deep fried, it is that I have to deep fry it. When it is warm out I despise standing over a pot of hot oil. No, for the summer I prefer baking my fish. Most of the time I can do it in my small convection toaster oven and the house stays blessedly cool. Nice! 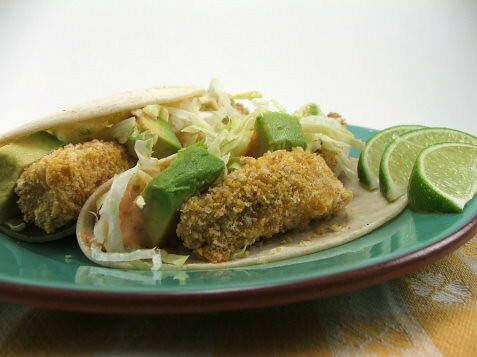 The fish is coated in a mixture of panko bread crumbs and finely crushed tortilla chips. I actually run mine through the food processor to get them blitzed to crumbs. 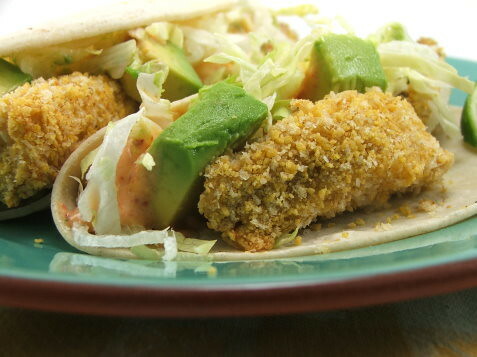 The chip crumbs and the panko make a wonderfully crunchy coating. The only other tip I shall give you is to cut the fish into rather small fingers. 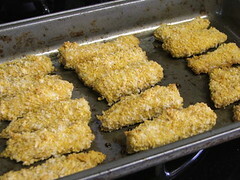 Not only does it speed up cooking, it gives the fish more crunch per bite. That can’t be bad! Heat your oven to 375F and spray a baking dish with non-stick spray. 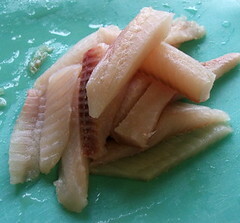 Cut the fish into 2” fingers. Set aside. 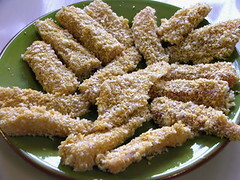 Combine the panko, tortilla chip crumbs, cumin, and salt in a shallow dish. Set aside. 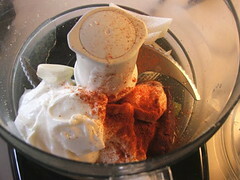 In a small bowl whisk the egg whites until slightly frothy. 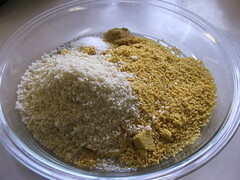 Dip the fish first into the egg whites then into the crumb mixture, making sure to coat the fish well. Set aside on a clean plate for ten minutes. 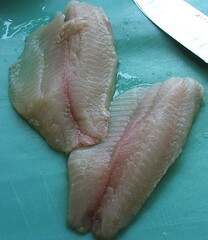 Bake for 12 to 16 minutes, or until the fish is golden and it reaches an internal temp of 145F. Time may vary depending on how thick your fish fingers are. 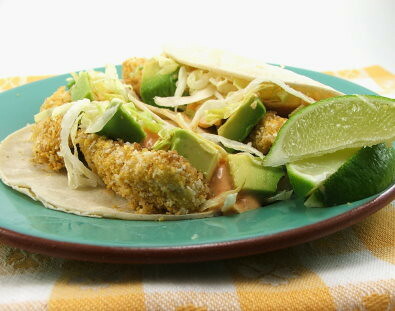 While the fish bakes make the sauce and heat your tortillas, wrapped in a damp cloth, in the microwave until soft. 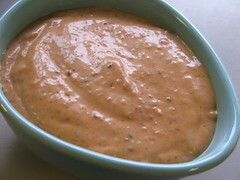 For the sauce, combine all the ingredients into a food processor and blend until mixed. 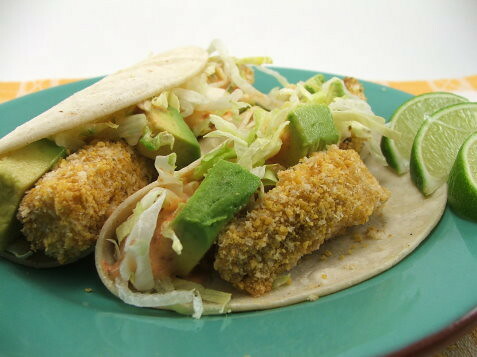 Build your tacos by laying down a layer of sauce, a layer of lettuce, some diced avocado, and two or three fish fingers. Spritz with lime and devour.